A security guard grabbed an upended crowd surfer at Tuesday's Vampire Weekend concert. "Some fathers take their daughters to tea," said my wife. I took mine to Vampire Weekend. Vampire Weekend is a band -- the "it" band of the summer. The band has played "Saturday Night Live," sold out the theater at Madison Square Garden. Despite features in both papers -- including a fresh interview by this paper's Gary Chun -- everyone looked at me blankly when I told them whom I was going to see. Even people under 30. Fortunately, my daughter returned this summer from college on the East Coast, ready, eager even, to broaden her father's musical tastes. "Hurry up," she said Tuesday. "The doors open at 7 p.m. By the way, I'm driving." Once we got to the Pipeline Cafe, she saw a crowd of kids she knew and ditched me. Remarkably, I also found some friends, mine being old enough to hang out at the bar. I wondered if anyone else brought a child with them. Then I met Brandon Sigal and Else Agdinaoay, who'd flown over from Maui for the concert. They'd brought their 4-year-old son, Joshua. "It's his favorite band," Else said. "He loves the song 'A-Punk.'" Vampire Weekend is not your usual snarling alt-rock band. New York Magazine published the band's picture with the caption, "Even you could beat up these guys." They're a bunch of J. Crew-wearing preppies, rhythmically dexterous, full of dry Ivy League wit. Sample lyric: "Your collegiate grief has left you dowdy in sweatshirts." There's no place to sit at Pipeline. People just stand shoulder to shoulder, back to front. My daughter texted me she was Right In Front! Curious, I made my way from the back of the room to within a row or so of the stage -- a more difficult feat than you might imagine. Never found my daughter. At some point I couldn't move. Jammed around me were young women, dancing in that particular bouncing-up-and-down style now favored by the young. Waves of body heat came off the crowd; sweat dripped off everyone. There were tidal surges of bodies, first one direction, then another. I just went with the flow. 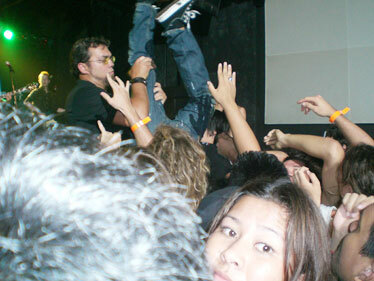 There was much crowd surfing, people lifted aloft and passed hand over hand to where the security guards would catch them before they reached the stage -- a mosh pit activity that was pretty much passe five years ago. After the concert, I found my daughter, asked if she, 5 foot 2 and petite, wasn't alarmed at being jostled and tossed in a sea of bodies. "Dad," she said, "you have to learn to throw an elbow every now and then." Last weekend, there was a raucous goodbye party at Hukilau for Ronna Bolante. At the tender age of 29, Bolante was the award-winning senior writer at Honolulu Magazine, also co-author of the book "The 50 Greatest Hawaii Albums." She's off to seek fame and fortune on the East Coast. She left a goodbye present. In the latest issue of Honolulu, check out her profile of Peter Carlisle, the tough-guy prosecutor who sometimes enjoys taking the stage in a tutu. Bolante talked with Carlisle's co-workers and critics, drove with Carlisle in his hot Mustang (he drives like an old lady, she insists), ate pizza with the prosecutor's wife and kids, even inspected his bathroom (to see where he hangs his awards). Can Reece Click on TV? Photographer Kim Taylor Reece is mulling over a contract from Rory Wild to do his own reality show. What's it called? "They are thinking of 'Search for a Kim Taylor Reece Model' or something like that," the photographer said. "I suppose that's better for TV than my usual image: 'Take your clothes off and I'll take your picture.'" So is he going to do the show? "I'd love to, as long as I can figure out a way to not make a fool of myself on television." Ran into my favorite state Senate hopeful, Brickwood Galuteria, the other morning. Asked Brick how political life was treating him. "I am in my humility phase right now," he said. "If you want to get elected, you have to walk the district." Galuteria figures he'll lose so much weight walking to meet voters that he'll have to tighten his belt a notch. "But then," he said, "the fundraising dinners put the weight right back on." I know, it's only August. But the first sign of Christmas is upon us. Michel Le, one of the most talented artists in town, has illustrated a new children's book, written by his wife, psychologist Christine Le. 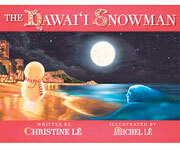 It's called "The Hawaii Snowman." It's an improbable title, but it's also an improbably beautiful book. As the self-sacrificing snowman begins to melt, so might even the chilliest heart. Merry Christmas. You probably haven't escaped the news that Cirque du Soleil is coming to town for a 28-show run starting at the end of October. Went to the glittery news conference, with the mayor's usual speech about how Honolulu is an entertainment and arts center. The event was enlivened by Eduardo Rodriguez and Adriana Pegueroles, two Argentinean dancers who perform with "boleadoras." Boleadoras are a weapon, three weighted balls on a long cord. Rodriguez and Pegueroles whip them around their bodies with speedy, intricate abandon. "Did you ever smack yourself in the face when you were learning?" I asked Adriana, who among her other arresting attributes is quite tall. "Yes, many times," she said. So how long did it take to learn how to dance with them? "It takes a couple of years just to stop being afraid."